On the other hand, another fruit, Szukis American persimmons, hardly look edible but still have rich, sweet flavor. 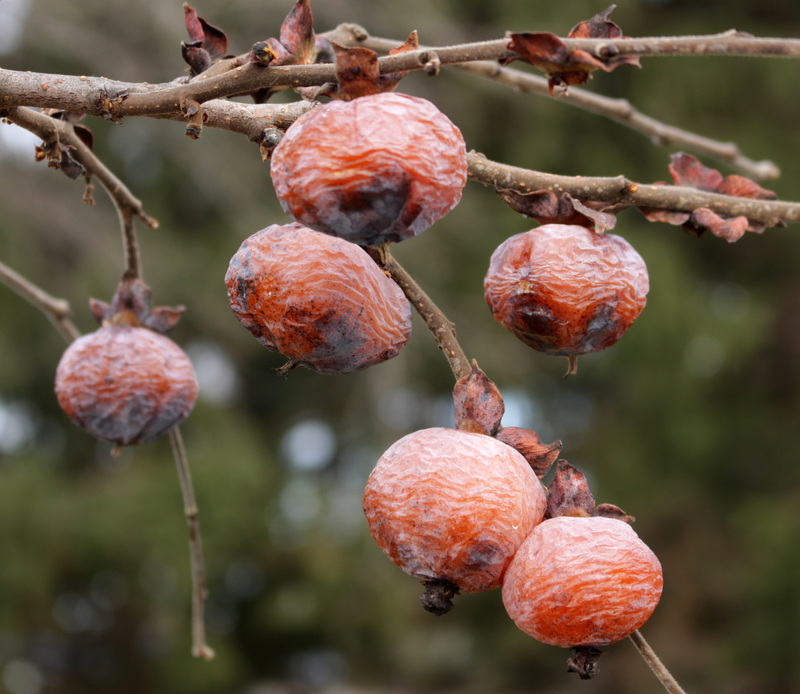 Outdoors, fruits of this variety of American persimmon cling to bare branches. Their orange skins once stretched almost to the point of breaking over the soft flesh within. 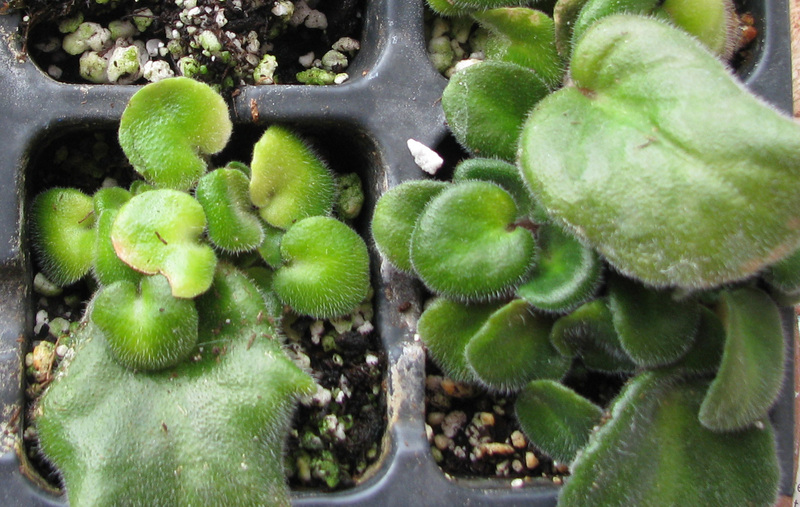 Now, alternate freezing and thawing temperatures and drier air have sucked moisture and temper from the flesh, so the skins have shriveled and barely cling. Their darkening does nothing to increase the fruits’ visual appeal. Man can’t live by bread alone; a feast for the eyes is also in order. Well, maybe not a feast, but an appetizer, some winter flowers. Probably the easiest and most longlasting of winter blossoms are those of African violet. Okay, okay, I know that African violets have been mostly associated with doilies, lace curtains, and other appurtenances of old ladies (nothing against old ladies). Generally, I don’t even like the color violet. 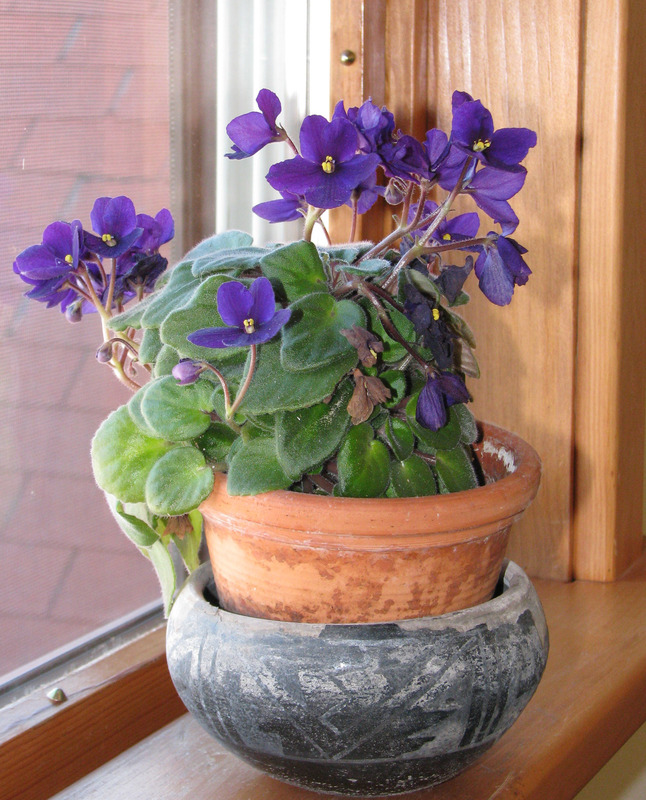 But African violet’s flowers do brighten up a windowsill that looks out upon a gray and brown landscape. Now that I’ve gotten my secret attraction to African violets off my chest, let’s talk horticulture. 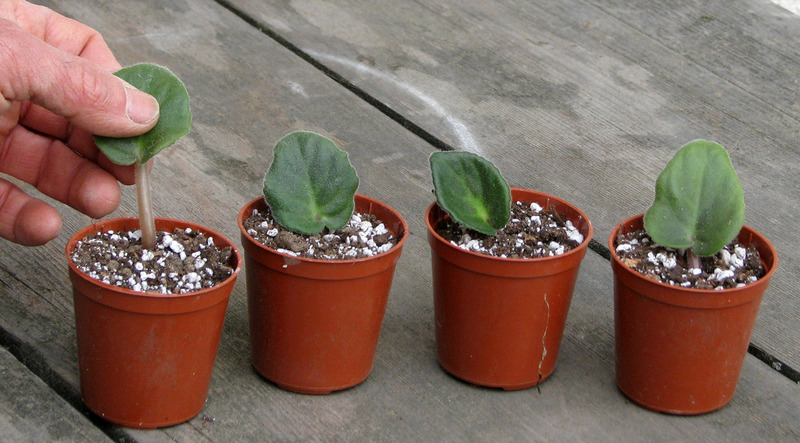 African violet’s whorl of leaves, like those of many low-growing perennial flowers, is actually a compressed stem, one that has been telescoped down so that each leaf and associated node originates just a fraction of an inch above the next lower leaf. But there is some distance between those nodes, so over time the stem does slowly elongate, rising higher and higher out of the ground. And side branches occasionally sprout forth from the leaf axils. The result of all this is that the potted plant becomes, over time, so overgrown with layer upon layer of leaves that the plant no longer can gather enough energy to flower well. African Violet in all its glory. The solution to this problem is to make new plants and then chuck the old ones. All that’s needed to make a new plant is a leaf from an old plant and patience. So a few weeks ago I plucked a few leaves (a few, for insurance) from my old, overgrown African violet and plunged their stalks into a moist mix of peat moss and perlite. 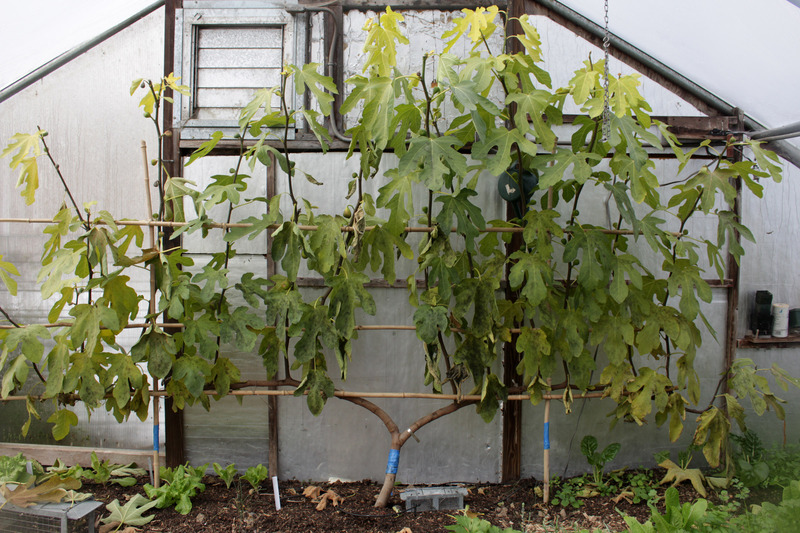 A plastic bag covering and held above the leaf cuttings by some twigs provided the needed humidity until roots could develop to keep the leaves turgid. Bright but indirect sunlight fueled, via photosynthesis, new root growth, and within a few weeks, resistance to a gentle tug on the leaves told me that roots had developed. I removed the cover and now little plants are poking up through the ground alongside the leaf stalks. I’m going to transplant my rooted cuttings into larger pots and should, in a few weeks, be enjoying flowers. By then, I’ll have my knitting also ready. On to less gender stereotyped gardening: tree planting. Picture the day before Thanksgiving, November 26th. A wet snow is falling and beginning to whiten the ground. In my garage are two sturdy, bare root apple trees, a Hudson’s Golden Gem and an Ashmead’s Kernel, recently arrived from Cummins Nursery and needing planting. Fortunately, I prepared the plantings site a couple of weeks previously with a 4-inch-deep, broad circle of leaf compost, the most immediate purpose of which was to keep the ground from freezing. Rushing to beat out the snow, I pulled enough compost aside to make space to dig holes, spread tree roots out in each hole, backfilled the soil, sifting it around the roots by pressing with my fingers and bouncing the tree up and down, and then settled all into place with a couple of gallons of water per plant. I like autumn for tree planting. Roots have opportunity to grow in still warm soil (especially if mulched) while stems won’t grow and need water until spring. The soil is crumbly and soft, in good condition for digging and planting. And autumn planting leaves one less thing to do in the flurry of spring gardening. However, winter temperatures and furry creatures can be a hazard to autumn-planted trees. The first line of defense, to fend off mice and rabbits and moderate temperatures on the trunk, is a spiral plastic tree guard. An 18” high cylinder of 1/2” hardware cloth provides further defense against mice and rabbits. Beyond that, a higher and wider cylinder of 2×4 fencing should fend off deer and my puppy Sammy. (Past puppies considered newly planted trees as playthings, fun to tug out of the ground.) And finally, the well-furnished, new tree goes into winter with some perfume, a deer-repellant spray, any of which is effective if applied before the plant gets nibbled and renewed monthly. I expect to harvest the first apples from the new apple trees expected in 3 years. This entry was posted in Flowers, Fruit, Gardening, Houseplants, Planning and tagged African violet, apple trees, apples, cuttings, fall harvest, figs, persimmons, planting, propagations, rabbits. Bookmark the permalink. Trackbacks are closed, but you can post a comment. What a great discussion of the end of this year, and preparing for next year. My fig season ended a month ago, so i’m impressed you were still getting some! It may still be a couple years for persimmons in my yard. I have Saijo about 7 feet tall and Nikita’s gift 3 ft tall. Nice discussion of African violets too! I’ve got a lot of knitting planned too. YOu’ve inspired me to try African violets. I look forward to those apples. I admire all the fruit you grow. I don’t think I would ever have the discipline to nourish and tend to so many fruits – but I’m sure you reap your rewards! I have grown African violets for years as my grandmother’s name was Violet and she always kept violets. I may be killing mine right now while I bask in a warmer climate – see, no discipline! I’ll find out when I return – at the very least, I can hope for a few viable leaves to regenerate. Merry Christmas (love those persimmon ornaments).